I talk to Katherine Moller about the three strands of her musical life, the challenges and opportunities of a music career and where she finds creative inspiration. Katherine Moller's father was a botanist, but he was also passionate about classical violin as well as fiddling. Katherine started taking classical violin lessons at the age of six and kept studying right through until high school. A turning point came when she was in middle school. Katherine says, "We went to Antigonish, NS for the Highland Games. We saw Natalie MacMaster and Ashley MacIsaac playing there. I fell in love with the Cape Breton style of fiddling at that point." Initially, Katherine was going to become a scientist like her father, but after some thought she decided to pursue music more seriously. She was accepted at McGill University and took her bachelor's degree in music there. She adds, "After my bachelor's degree, I moved to Ireland and lived there for a year. I traveled around and studied fiddling with help from a Canada Council grant." She returned to Canada for a brief stop that turned out to be less brief after she met (and married) a man who had lived just around the corner from her when she was growing up. She's now based out of New Brunswick and is deeply involved in the music scene across the Maritimes. The second leg of the tripod is Baroque music to which Katherine was introduced at McGill. She says she hadn't really listened to it at that point and once she'd heard it played on period instruments, she was drawn to it and began playing it herself on instruments of the era. Since then, she’s played in several Baroque ensembles. One of the period instruments she played was a violin she discovered in her father's collection. She was going to get her modern violin strung with gut strings but her father allowed her to choose a violin from his collection. Katherine thought that it might be a Baroque violin. After taking it to a luthier in Montréal, she confirmed that it was a 17th century German violin. The third leg of her musical tripod is Celtic music. Katherine says, "I play solo which really means that I play with a guitarist. I also have a four piece Celtic band called Different Folk." Until recently, Katherine has kept these three legs of her career separate but her latest album is about to change that trend. She explains, "The last four CDs I’ve released have been in the Celtic genre and all relatively traditional. Last summer, I decided to record my fifth CD. It's called Storm Queen and it's 100% original material. It was time to do something different with a new project." She worked with producers Paul Milner and Dan Cutrona at Milner's studio in P.E.I. She says, "We arranged my original tunes in a completely different way. My other musical worlds have all come together to create a Celtic sound with orchestral backing. The tunes are all Celtic tunes that I've written with a standard fiddle tune structure, but we've backed them up with more orchestral sounds and we've also used sounds that come out of Baroque music like the lute and the harpsichord." She contrasts this with recording and says, “One challenge in the studio is making your music sound alive. You're concentrating so hard on everything being perfect that sometimes you can lose the energy in the playing." Another challenge is trying to differentiate herself from the other fiddlers out there right now. Katherine says, "I'm really excited with this new CD because it opens up new possibilities. I joked about hiring the symphony for my CD launch and as it turned out I did actually hire Symphony New Brunswick for it." In the future, Katherine wants to arrange the pieces from her latest album for string quartet. She explains, "If I pare down the arrangements so I can have a string quartet and my band it would be more feasible in terms of touring. I've also thought about touring and using local string quartets or local orchestras, so that I only have to tour with the band. I'm really excited about the possibilities there!" Another aspect of Katherine's life is her work as a music teacher. While it started out as something she did to make money in university, it grew into something about which she's passionate. She explains, "It's a responsibility and a pleasure to be able to pass on my knowledge to youth. It's a great experience to work with students and see that light bulb go on when they finally get something after you've managed to break through." She adds, "Knowing how to play music is one thing but being able to clearly explain to someone how to do it requires a whole other level of understanding." When it comes to her musical inspirations, Katherine is drawn towards people who take traditional music styles and move them in new directions. 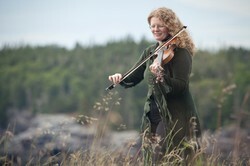 She says, "Alisdair Fraser has always been my guiding light in fiddle music. His tone is so smooth and beautiful. I've also been listening to a lot of music from the band Còig. They're very much in the traditional realm as far as instrumentation goes but they've been doing a lot of interesting things with arrangements." She adds, "I guess that's something that really appeals to me in all of this music. It's not only traditional, but it's pushing things ahead." For more information on Katherine, please visit her website here. This profile of Katherine Moller is based on a telephone interview conducted and recorded on Jan. 23, 2017. Ludwig van Beethoven is probably the best known composer of classical music. Who has not heard and loved his works such as the Moonlight Sonata? The Ultimate Aaron Tippin Audio CD stands strong with its title song taking a stand for right against wrong.